Charming map of Grand Bay, Alabama and environs. Sketch H. No. 7 Grand Bay Including the Entrance of Horn Island Pass. 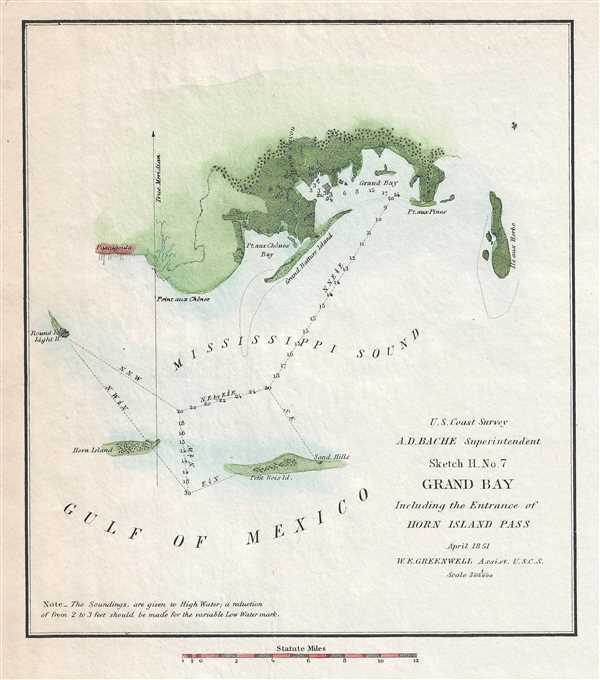 This is an 1851 U. S. Coast Survey nautical chart or map of Grand Bay, Alabama and the Mississippi. Divided in half by the Alabama-Mississippi state line, this map depicts both parts of both states from Pascagoula, Mississippi to Point Aux Pins (Pt. aux Pines) and Isle Aux Herbes, Alabama. Some coastal detail is included, particularly along Grand Bay and Point aux Chênes Bay. Principal sea routes are illustrated with directions depth soundings included. The Round Island Lighthouse is labeled, along with Horn Island and Petit Bois Island which appear to lie between Mississippi Sound and the Gulf of Mexico. This map was compiled under the direction of A. D. Bache, Superintendent of the Survey of the Coast of the United States and one of the most influential American cartographers of the 19th century. It was issued in the 1851 edition of the Superintendent's Report.